The single appeared on U2's second album October. The Latin chorus of Gloria was inspired by Bono listening to Paul McGuinness' Gregorian chant albums. 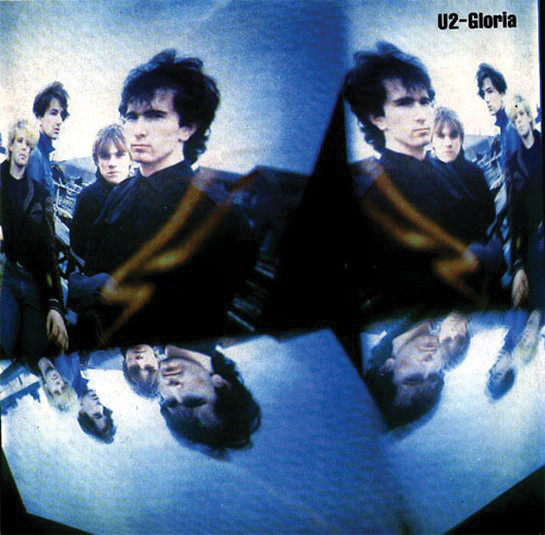 Gloria was premiered live during U2's performance at the Slane Festival, August 16, 1981, where they were the support act for Thin Lizzy. They also used this appearance to introduce four other songs from their upcoming album October. In the US, Gloria did not receive much airplay on national radio; however, college stations embraced the song. With the help of this and frequent rotation of the video on MTV, U2 outgrew the club scene and were soon playing to larger audiences in theatres. A live version of the song recorded at Red Rocks in Denver, Colorado on June 5, 1983 appeared on the EP and video Under A Blood Red Sky. The album version of the song can also be found on Wheel to Reel. Hootie and the Blowfish have performed Gloria live in concert. 'I actually really like that lyric. It was written really quickly. I think it expresses - the thing of language again. This thing of speaking in tongues. Looking for a way out of language. 'I try to sing this song... I try to stand up but I can't find my feet...' And taking this Latin thing, this hymn thing. It's so outrageous at the end going to the full Latin whack. That still makes me smile. It's so wonderfully mad and epic and operatic.